Powers/Abilities: Harry Bright's Guardsman armor possesses the standard capabilities of the Guardsman armor units, including enhanced speed, enhanced strength, offensive weaponry, and flight capabilities. 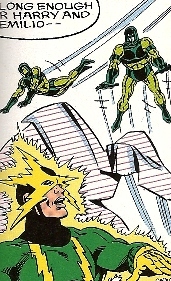 (Iron Man I#228) - As part of the Vault's six man retrieval team, Guardsmen Harry Bright and Emilio Layton responded to an escaped Electro (secretly James Rhodes), who was attacking Denver. They surrounded him with pavement pieces to block his attacks, then Harry and Emilio dropped a nonconductive net over him. They soon imprisoned him in a special cell at the Vault. Comments: Created by David Michelinie, Mark Bright, and Bob Layton. Harry Bright's last name was revealed in the Guardsmen entry in the Iron Manual.